Dramatic re-enactment of "The Miracle on the Hudson." And don't say "What's 'The Miracle on the Hudson?'" Because if you don't know what "The Miracle on the Hudson" was, you must have been living in a hut since 2009 with no TV, Internet or radio, smoking ganga with a primitive people who have yet to be discovered! 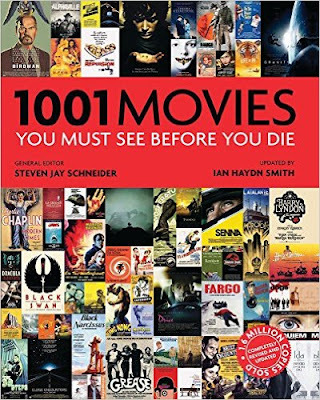 Why does someone like me, who is a white-knuckle flyer at best, watch a film like this? Well, aren't we all fascinated with things that scare us most? And since we all know how this ends (and if you don't, refer to what I just said in the preceding paragraph), I watched because I wanted to see a possible plane disaster that ended well. Tom Hanks plays Chesley "Sully" Sullenberger, a ex-military pilot with over 40 years experience as a commercial pilot. On January 15, 2009, as his U.S Airways plane took off from New York's La Guardia airport headed for Charlotte, N.C. the plane was hit by a large flock of geese which took out both engines. Sully had about 40 seconds to decide what to do. Realizing he could not make it back to La Guardia or Teterboro airports, he decided his best course of action was to land the plane in the Hudson River. And that's what he did. With 155 passengers and crew on board (or as they refer to passengers in the airline industry, "souls"), all survived thanks to the quick thinking and EXPERIENCE of Sully Sullenberger. This is the ultimate homage to us old folks and the value of experience. 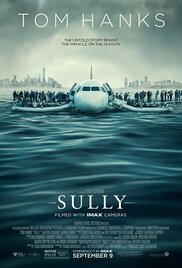 The film begins with Sully having nightmares about the event and his anxiety about being judged for that one flight at a hearing, where his judgment is called into question and he has to justify landing in the river. You see, airline companies are not fond of losing their aircraft. They would have much preferred that Captain Sullenberger had gotten that plane back to the airport in one piece. Why didn't he? "After a 42 year career carrying millions of people safely from place to place I don't want to be judged on 208 seconds." There was some dispute about whether or not he was really grilled like that by the NTSB as depicted in the film. Doesn't matter. A film about a real life event doesn't necessarily have to replicate it - we need drama after all - but the point was made. Someone who has done a job well for 42 years knows what he is doing. You might wonder how this film could be interesting since you know the outcome, but let me tell you, from start to finish this film is gripping and moving. There is a scene showing the plane losing altitude as Sully gets ready to land the plane in the Hudson River. As people look out the windows of the high rises and see this plane going down, down, down, almost as if heading toward them, one can't help but wonder if they were thinking of 9/11. Likewise, just as the people of New York City pulled together after 9/11, so did the ferries and the first responders come together to save the survivors of the plane crash and quickly get them out of the freezing river. I think Clint meant for us to get that connection. Speaking of Clint, Clint Eastwood directed this film and, I have to say, Clint may be old and scaring us by talking to a chair at a Republican Convention, but he can still direct a damn fine film. Once again, old also means experienced. And credit must be given to Todd Komarnicki's screenplay(adapted from Sullenberger's memoir "Highest Duty") which is tight, gripping and creates a "you-are-there" feeling for the audience. Hanks gives a fantastic performance and seems to embody Sullenberger. I say an Oscar nomination is in the works for him, though this film was released earlier than most Oscar contenders and might get forgotten. Aaron Eckhart as Sully's co-pilot is also excellent, though in a small part. Likewise, Laura Linney has a small role as Sully's wife, but doesn't have much to do except act concerned. I couldn't help but compare this film to Paul Greengrass's "United 93," the film about the plane that went down in Pennsylvania on 9/11. Though it had a very different and tragic outcome, it highlighted the heroism of people under pressure on an airplane, and for some reason, I find such films compelling, moving and emotional. Ring, ring, Mr. Tom Hanks? Oscar calling. My first nomination of the year. Rosy the Reviewer says...I cried. It was that good. An American salesman travels to Saudi Arabia to sell his computer product to a wealthy monarch in hopes of salvaging his career. Well, it's not that bad, but there was Tom Hanks starring as Sully Sullenberger in "Sully (see above)" and then there was Tom Hanks starring as a struggling salesman in this one. He's everywhere these days. It's not a bad film, it just doesn't do him justice and doesn't really go anywhere. Alan Clay is a salesman with problems. He is caught in the recession, his career is not going well, he has lost his house, he doesn't have the money to send his daughter to college and he is getting divorced. He is also suffering from panic attacks. 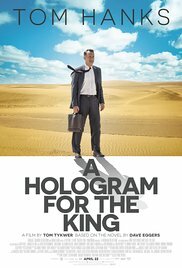 As a last ditch effort to resurrect his career, he travels to Saudi Arabia to the King's Metropolis of Economy and Trade to sell his company's holographic teleconferencing software to a king. Let's just say that Alan is also having a midlife crisis. Using similar plot devices to "Whiskey Tango Foxtrot," - fish out of water, the sympathetic driver, the love interest, the desert - this film puts Alan in an almost Kafkaesque world of cold bureaucracy, where the king is never available and Alan waits and waits an wonders if he will ever meet him. So what do you do when things aren't working out for you? Why you go on a road trip. Alan's driver takes him to Mecca where Alan takes some pictures which is a no-no and he is mistaken for a spy working for the CIA. He also meets a woman doctor and an affair ensues. And those are the exciting parts. Though Hanks is always good, one wonders why he was attracted to this project. It doesn't really add anything to his resume and certainly doesn't showcase his talent like "Sully" does. Written and directed by Tom Tykwer, who wrote and directed one of my all-time favorite movies, "Run Lola Run," and based on Dave Eggers' 2012 novel which was a National Book Award finalist, I wanted to like this movie. But I couldn't help but think that despite all of that star power (Hanks), literary background (Egger's novel), and the director of a movie I loved, what happened? Why was I wondering, "What's the point?" What started out as an interesting idea - how a middle-aged guy copes with globalization and a mid-life crisis - was never fleshed out and just fizzles out into a run-of-the mill love story. Rosy the Reviewer says...if you like Hanks, see "Sully" instead. There is good news and bad news. The bad news is that in this dystopian world, unmarried people are sent to "The Hotel," where they must find a mate within 45 days or they will be turned into an animal. The good news is: you get to choose your animal. Our hero chooses a lobster. The film begins with a long shot of a woman driving. She sees a donkey, stops, gets out and shoots the donkey and then calmly gets back into the car and drives away. Huh? Next we see our hero, David (Colin Farrell) at "The Hotel." David has had a marital break-up and we discover that in this world, one must have a mate. One cannot be a "loner." "How easy life is when there are two rather than one." He is read the rules by the hotel manager, played by the wonderful Olivia Colman, who you may recognize from the equally wonderful "Broadchurch," and David dutifully accepts his fate and goes along. It's a sort of macabre match-making hotel. The rules are these: If you don't fall in love within 45 days you will be turned into an animal. However, you can't just pick anyone You have to have something in common with that person. In the meantime, no masturbation. If caught, something very bad happens to you like having to put your hand in a toaster. You are also required to go on hunts at night, hunting loners and shooting them with tranquilizer guns. The more loners you round up, the more days you get added on to your 45. It's a sort of "Hunger Games" for singles. There is a funny scene where the hotel staff enacts scenes to show how bad being alone is e.g. what if you choke and there is no one to save you? What if you are attacked and there is no one to defend you? David meets his fellow inmates, a guy with a lisp (John C. Reilly) and a guy with a limp (Ben Whishaw) and the three pal around. They all must find a woman with a similar trait. There is a girl who has nosebleeds and is an expert at getting blood stains out. Our guy with the lisp feels like he will never find anyone so he bangs his head against the wall until his nose bleeds. Voila! He now has something in common with nosebleed girl and they couple up. David meets a woman who is near sighted (Rachel Weisz). So is David, so now he has something in common with someone. She introduces him to the loners in the woods and their leader (Lea Seydoux, who you might recognize from "Spectre" and "The Grand Budapest Hotel."). The loners plan on raiding the hotel and killing all of the couples. David and his match decide to become loners and ironically, the loners also have enforced rules: you are forbidden to couple up. Naturally David and the short-sighted gal fall in love and then the trouble really begins. The feel of this film brings Kafka's "Metamorphosis" to mind and the strange characters and world they live in reminds me of the films of Wes Anderson. The score is strident and discordant, fitting for the anxiety these people must be feeling trying to find someone to love before they are turned into animals. 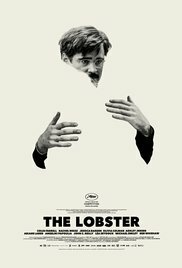 This unique story was written by Yorgos Lanthimos and Efthimis Filippou and directed by Lanthimos. This all sounds very strange, I know. You have to have been there, as they say. But this is a phenomenal film. One of my favorites of the year. Farrell is good at playing a confused, morose guy out of his element and is very believable and draws you into this strange world with him. Rachel Weitz is also very good. Despite her Best Supporting Actress Oscar in 2006, I don't think she gets enough credit for her work, probably because she doesn't often carry a film on her own, so looking forward to her upcoming starring role in the film "Denial." The film is a black comedy, a grim satire on "the rules" of love and relationships that today are especially confusing, seemingly governed by computer apps. It also seems to say that we value being in a couple above all else and will do anything not to be alone, even bang our heads against a table until our nose bleeds. Rosy the Reviewer says...if you like your films fresh and original, this is a unique film experience that should not be missed. An ex-private eye tries to escape his past running a gas station in a small northern California town but his past catches up with him. When I reviewed the classic film noir "Murder My Sweet" back in June, I listed all of the requirements a movie must meet to be considered film noir: hard-boiled detective, beautiful but double-crossing dame, snappy dialogue, and lots and lots of smoking...you know the drill. 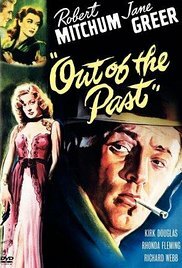 And this film does not disappoint, thanks mostly to star Robert Mitchum, who just about defines the hard-boiled detective with his hooded eyes, sarcastic snarl, ever-present cigarette dangling from his pouty lower lip and relaxed demeanor, no matter how many times he is double-crossed. Here he plays Jeff Markham AKA as Jeff Bailey. Jeff has moved to a small town, changed his name, opened a gas station, has a nice girlfriend, Ann (Virginia Huston), and is trying to mind his own business, that is, until Joe (Paul Valentine) shows up. Joe has been looking for Jeff and tells him that he needs to go meet Whit Sterling (Kirk Douglas) in Lake Tahoe. Jeff takes Ann with him and while making their way to Lake Tahoe, Jeff confesses who he really is, and through flashbacks (another film noir device), we learn that Jeff was a detective. Whit Sterling had been shot by his girlfriend, Kathie (Jane Greer), and she had run off with $40,000 of his money. Whit had hired Jeff to find her. Jeff tracked her to Mexico , but you see, these women who shoot their boyfriends and run off with their money, are not to be taken lightly. She had worked her magic on our hero and the two started a relationship. They tried to elude Whit and his minions but were eventually tracked down and then Kathie shot yet another guy and disappeared. Kathie is not a very nice girl. So Jeff had decided, since he had double-crossed Whit, he had better get a new identity and hide out from Whit, and that's how he ended up in that small town. Jeff has been found by Whit's henchman and is heading back to face the music with Whit. But who should be there with Whit? Why, it's Kathie! Whit has forgiven her and Whit, in every bit of unctuousness that Kirk's acting can muster, tells Jeff he's not mad for double-crossing him and trying to run off with his girl, but if he wants to make things right with him, he needs Jeff to get some documents from his lawyer. It seems that Whit hasn't been paying his taxes and his lawyer is blackmailing him. Whit's lawyer has the documents that show that Whit has been remiss and Whit will face prison if the tax man finds out. It's the least he can do for Whit after trying to run off with his girl, right? Jeff agrees but soon learns that he is being set up. Let's just say there are two more murders to come and all at the hands of our little Kathie. Kathie is one badass dame! Why it's a Must See: "[This film] adapted from Daniel Mainwaring's novel Build My Gallows High, may be the masterpiece of film noir. All the elements are there: the woman who lies...The bitter past that rises up again and destroys the main character [and] The private eye...a man of wit and know-how who makes the mistake of giving in to his passion -- more than once." "A dame with a rod is like a guy with a knitting needle." "Shall I take you somewhere else?" "You can take me anywhere." "Do you always go around leaving your fingerprints on a girl's shoulder? Not that I mind particularly. You have strong hands." "Oh, Jeff, I don't want to die." "Neither do I, baby, but if I have to, I'm gonna die last." Rosy the Reviewer says...a darn good story with a very bad girl. They don't make 'em like this anymore. Van Der Leun examines the murder of Amy Biehl, a white American Fulbright scholar who, in 1993, was brutally murdered by a mob of young black men outside of Cape Town during the final days of South Africa's apartheid. Amy Biehl was 26 and had been living in South Africa for a few years, working as an anti-apartheid activist with a special interest in women's issues. Her murder was a cruel irony. Because her parents forgave her murderers, she became a symbol of the Truth and Reconciliation process in South Africa, where those who were deemed freedom fighters were pardoned for their crimes. Amy became a symbol of the process working. However, the more Van Der Leun examined the case, spoke with eye-witnesses and befriended one of the so-called killers, not only did the accepted facts not add up but perhaps her convicted killers were not her killers after all. Van Der Leun spent four years investigating Amy's story and stumbled upon people and incidents that belied what the prevailing wisdom had been. What was the truth? Would she ever unravel the truth? As Amy's story unfolds, so does the story of South Africa and its people. 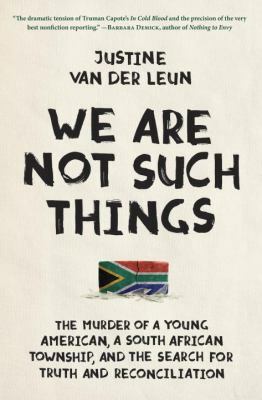 Van Der Leun has written an absorbing (if a bit long) and fascinating insight into the history and current political reality of South Africa where one of the convicted killers says "The truth is not anymore existing for years and years." Rosy the Reviewer says...if you are interested in true crime in the vein of Truman Capote's "In Cold Blood"or the history of South Africa and apartheid, you will enjoy this book. I am still awe-struck by Sully. It was such an emotional movie. 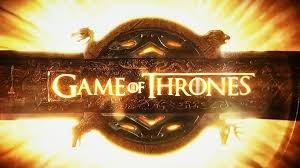 Even though I knew how it ended I was captivated by the drama. When the ferries were rushing to the scene I could barely breathe. Just to think how those people all thought they were going to die and then they didn't... and then they thought they might freeze to death (or drown) and then they didn't.....it was very powerful. The NTSB hearing could have been tedious but it added to the suspense (suspenseful even though we knew Sully was cleared! How did they do that?) I don't know whether it was Eastwood or Hanks or both, but...bravo!!! I so agree. I hope the Academy rewards this film with some nominations.